There’s more news on the financial front for embattled casino giant Caesars Entertainment Inc., parent company of the World Series of Poker, which has seen its complex restructuring and planned Chapter 11 bankruptcy for its Caesars Entertainment Operating Company (CEOC) come off the tracks in recent months. In the latest setback, senior lienholders are now threatening to walk away from Caesars preferred restructuring plan, a plan which appears headed for a tough legal future anyway. Reuters was the first to report that a group of the first-lien debtors have filed a brief in connection with the CEOC bankruptcy and planned restructuring, stating that they may soon file their own restructuring plan. The group’s interests were initially well-served under Caesars’ original plan, which began with Caesars attempt to corral the worst of its debt into its CEOC operational shell, while jilting a secondary group of corporate investors. Caesars’ initial plans were to leave those secondary noteholders a largely empty bag while shedding roughly ten billion dollars in debt from its books, giving those debtors just pennies on the dollar. Those debtors have sued Caesars, and though the final rulings have yet to be made, those junior creditors appear to have the upper hand, and will likely prevail on their claims that Caesars’ original CEOC bankruptcy plan was a fraudulent attempt to protect other, more valuable assets. Essentially, the second-tier noteholders’ prospective gain is the first-tier noteholders’ loss, and that’s why those senior noteholder now plan to walk away. Caesars was originally able to obtain the approval of over 60% of those shareholders, but that cooperation is vanishing. Some appeasements were made toward the second-tier group in October, but those necessarily came from the the first tier’s interests. The group that filed its intent on Tuesday noted “a very substantial decline in the value of the debt and equity securities proposed to be provided” as the planned reason for walking away from the deal. “If sufficient progress toward a consensual plan is not made (…) it may very well be that a plan proposed by the first lien bank and noteholders becomes the most efficient means to allow (the company) to emerge in a timely manner from bankruptcy,” the group’s filing added. If it all falls apart, then Caesars itself is far more likely to undergo a corporate breakup or a forced takeover in the years ahead. It’s all been part of the same financial problem: The desire of Caesars’ controlling management to squeeze several gallons of financial fluid from a single-gallon jug. Caesars (formerly Harrah’s) has been in desperate straits ever since the earlier company was taken private in a highly leveraged acquisition back in 2008 by private equity owners Apollo Global Management and TPG Capital Management. 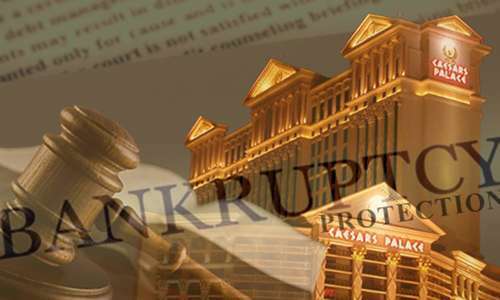 That $30 billion dollar deal blew up almost immediately when the global real-estate bubble burst just months later, leaving Caesars buried under a mountain of debt no longer supportable by the presumed value of their dozens of casino properties. Caesars, as it was later renamed, has been dodging its financial waterloo ever since, with the CEOC bankruptcy filing largely inevitable for years. It’s also the only way that original private-equity investors Apollo and TPG could attempt to hold on to the company and get something out of their own investments. Except, in a fair world, it really should be Apollo and TPG that are left holding the bag, and if the CEOC bankruptcy scheme ends up being nuked, that’ll be the likeliest outcome. Neither the first- nor second-tier lienholders will ever receive full value on their investments, but years down the road, they’ll get something. Thus begins the demise of Caesars, perhaps. That it’s all something of a fait accompli can be seen in the value of Caesars (CZR) stock after the latest filing. It held steady, a sure indication that the financial world already saw this one coming.